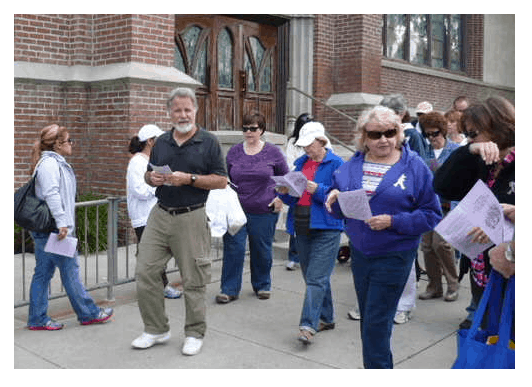 Last week I was invited by Kent Peters, Catholic Diocese Office for Social Services Director, to talk about domestic violence at the event Twentieth Annual Walk with the Suffering Good Friday Stations of the Cross, April 22, 2011, sponsored by the Ecumenical Council of San Diego County. Kent and I have known each other for several years working together primarily on subcommittees of the San Diego Domestic Violence Council, the Men’s Leadership Forum and the non denominational group Safe Faith Based Communities. The Men’s Leadership Forum is tasked with involving male community leaders in efforts to reduce family violence. Over the years the Forum has hosted yearly one day conferences about domestic violence. Three years ago one of the keynote speakers, John Hamel, LCSW and one of the world’s leading family violence researchers, and a major breakout session offered information about male victims. 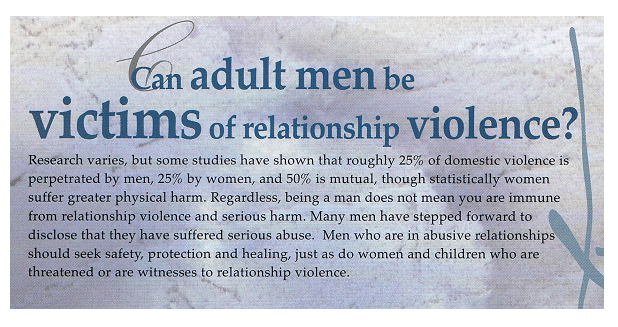 Excerpt about abused men from Safe Faith Place Communities ten page high gloss domestic violence brochure. Safe Faith Based Communities developed a nondenominational domestic violence information, education, and referral program which has been implemented in several places of worship. We developed a brochure, workbook, training materials, and trained volunteers. The program included information about abused men. In fact, to my knowledge, the brochure was one of the first in the country, if not the first, produced by a domestic violence council that included information about abused men. National Coalition For Men wristbands. New members get one if we have them in stock. The event starts at 8:30 a.m. in downtown San Diego in front of a rescue mission accompanied this year by a few television station news reporters. This reenactment of the crucifixion procession involves a large group of believers who accompany Jesus Christ (in this case a young actor) through the streets of San Diego as if it were Jerusalem. The procession stops 14 times. At each stop someone talks about social services offered in the community, then there’s a prayer. Kent and I were station four: Reflection on suffering caused by family violence. I gave a brief overview of the National Coalition For Men and our California Men’s Centers, but I primarily talked about how over the last several years the domestic violence and related industries are becoming better educated and receptive about working with male victims. I asked the crowd to keep an open mind and explained that family violence is not gender specific, everyone feels pain, everyone bleeds. Kent said the prayer. He may have been thankful I was not stoned. I had to get to Family Court where I anticipated one of “my guys” from the Men’s Center was about to be stoned…” Different crosses to bear for sure. NOTE: No, this is, in no way, an appeal for organized religion or Jesus Christ. NCFM is a men’s rights organization not a religion. However, if you are a believer and you find yourself in a stressful family situation, like perhaps an abusive one, be careful not to lose your faith. Even I’ve seen it work wonders. One exception, if you have faith in the fading religion Political Correctness you might want to find something else with which to share a prayer. Harry you are my hero ! Awesome work Harry and Kent!